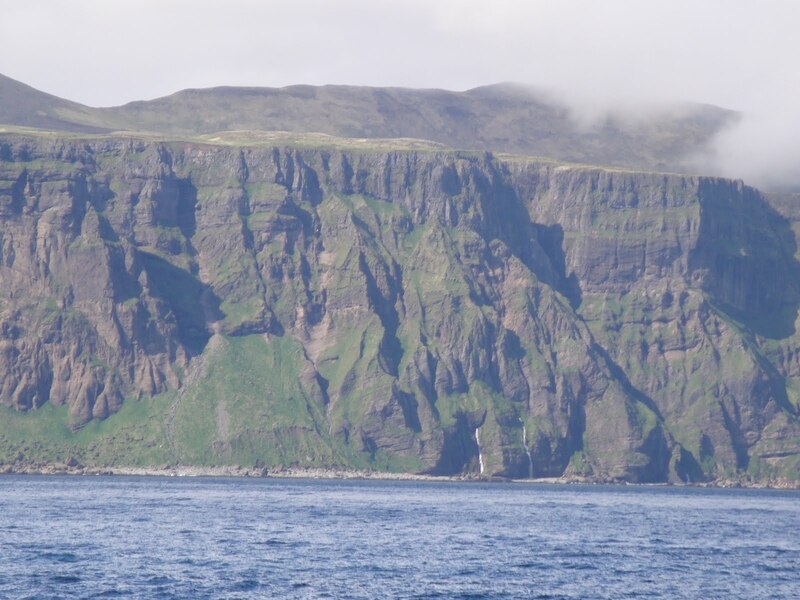 The salmon and the black-legged kittiwake are both biotic members of the sub-arctic ecosystem. “Non-living” describes things that are not, cannot, and never will be “alive.” These things are referred to as “abiotic.” (The prefix a- basically means the same as non-). Rocks, water, wind, sunlight and temperature are all considered abiotic factors. And while the most obvious threat to a salmon swimming up river might be the slash of a bear’s mighty claw, warm water could be even more deadly. Warm water carries less dissolved oxygen for the fish to absorb through their gills. This means that a power plant or factory that releases warm water into a river could actually cause fish to suffocate and, well, drown. A 90 degree panorama of the Bering Sea from atop the Oscar Dyson. I’d show you the other 270°, but it’s pretty much the same. 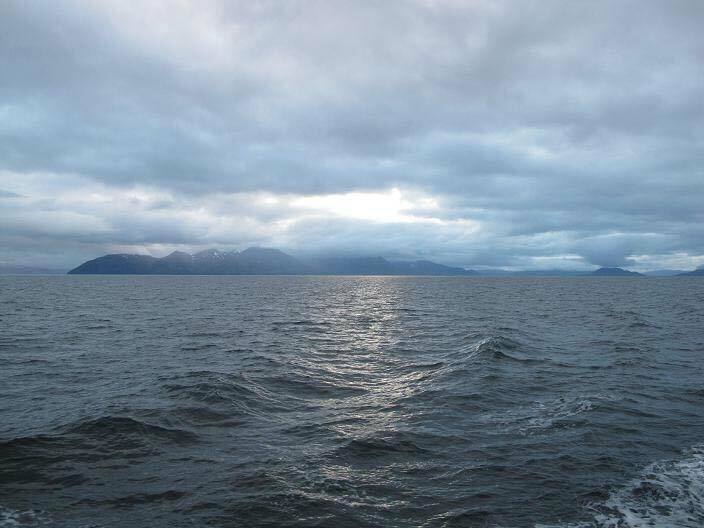 The sea and sky are abiotic parts of the sub-arctic ecosystem. Fish in the Bering Sea have the same kind of challenges. Like Goldilocks, Pollock are always looking for sea water that is just right. The Oscar Dyson has the tools for testing all sorts of Abiotic factors. This is the Conductivity Temperature Depth sensor (Also known as the CTD). 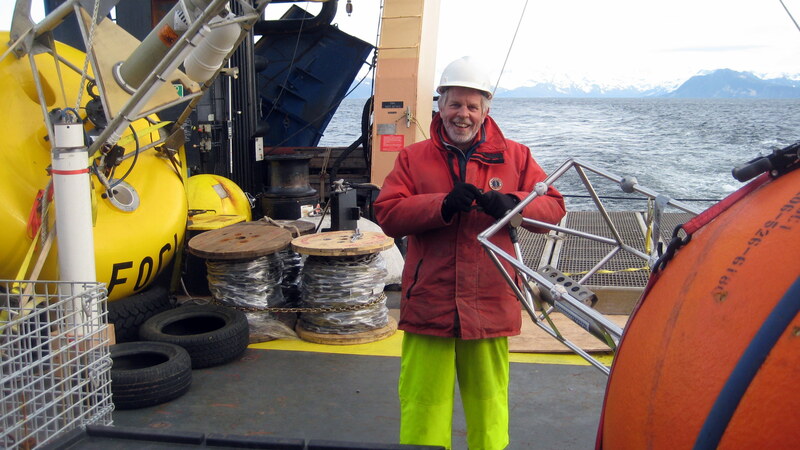 Survey Technicians Allen and Bill teach me how to launch The Conductivity Temperature Depth Probe (or CTD). The CTD sends signals up to computers in the cave to explain all sorts of abiotic conditions in the water column. It can measure how salty the water is by testing how well the water conducts electricity. It can tell you how cloudy, or turbid, the water is with a turbidity sensor. It can even tell you things like the amount of oxygen dissolved in the ocean. To see how abiotic factors drive biotic factors, take a look at this. The graph above is depth-oriented. The further down you go on the graph, the deeper in the water column you are. 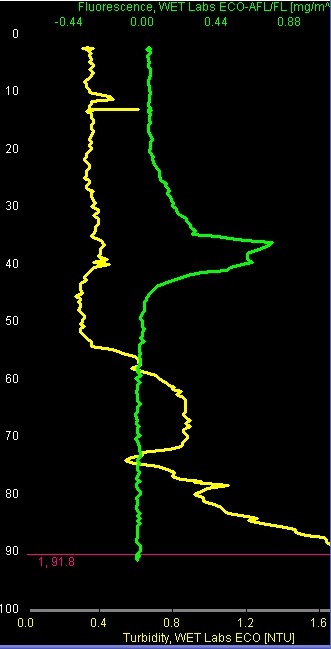 The blue line represents temperature. Does the temperature stay constant? Where does it change? I know, you may want to turn the graph above on its side… but don’t. You’ll notice that depth is on the y-axis (left). That means that the further down you are on the graph, the deeper in the sea you are. 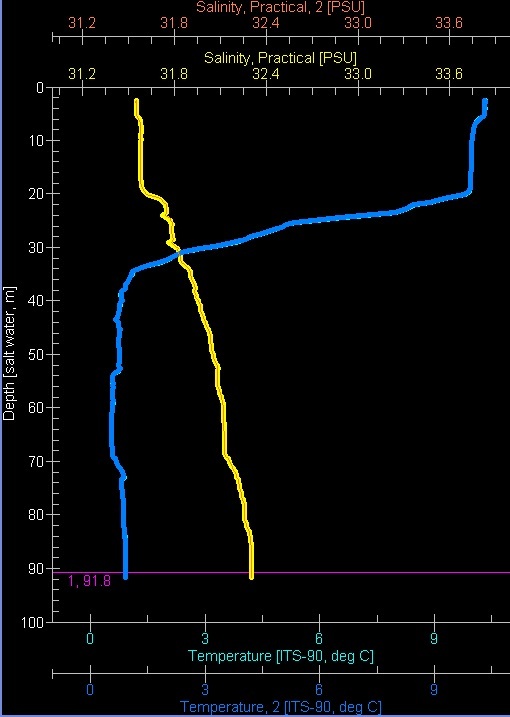 The blue line represents the water temperature at that depth. Where do you see the temperature drop? 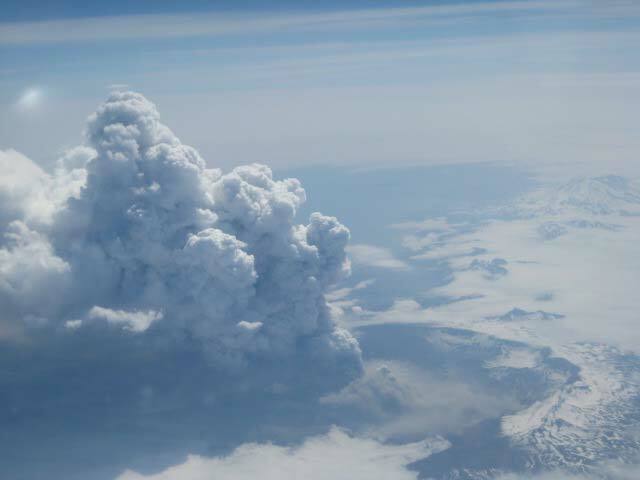 Right… The temperature drops rapidly between about 20 and 35 meters. This part of the water column is called the Thermocline, and you’ll find it in much of the world’s oceans. It’s essentially where the temperature between surface waters (which are heated by the sun) and the deeper waters (typically dark and cold) mix together. Well, look at the graph to the right. It was made from another kind of data recorded by the CTD. Fluoresence: Another depth-oriented graph from the CTD… the green line effectively shows us the amount of phytoplankton in the water column, based on depth. The green line represents the amount of fluorescence. Fluorescence is a marker of phytoplankton. Phytoplankton are plant-like protists… the great producers of the sea! The more fluorescence, the more phytoplankton you have. Phytoplankton love to live right at the bottom of the thermocline. It gives them the best of both worlds: sunlight from above and nutrients from the bottom of the sea, which so many animals call home. Now, if you’re a fish… especially a vegetarian fish, you just said: “Dinner? I’m listening…” But there’s an added bonus. Oxygen data from the CTD! This shows where the most dissolved oxygen is in the water column, based on depth. Notice any connections to the other graphs? 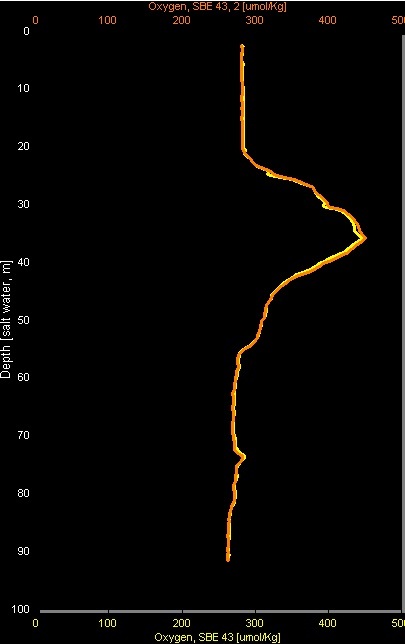 That orange line represents the amount of oxygen dissolved in the water. How does that compare to the other graphs? Yup! The phytoplankton is hanging down there at the bottom of the thermocline cranking out oxygen! What a fine place to be a fish! Dinner and plenty of fresh air to breathe! So here, the abiotic (the temperature) drives the biotic (phytoplankton) which then drives the abiotic again (oxygen). This dance between biotic and abiotic plays out throughout earth’s ecosystems. The blue cloud represents a last grouping of fish as the continental shelf drops into the deep. Dr. Mikhail examines a cod. He goes on to show me how Pollock in the Bering Sea are only found on the continental shelf between the Aleutian Islands and Northeastern Russia. 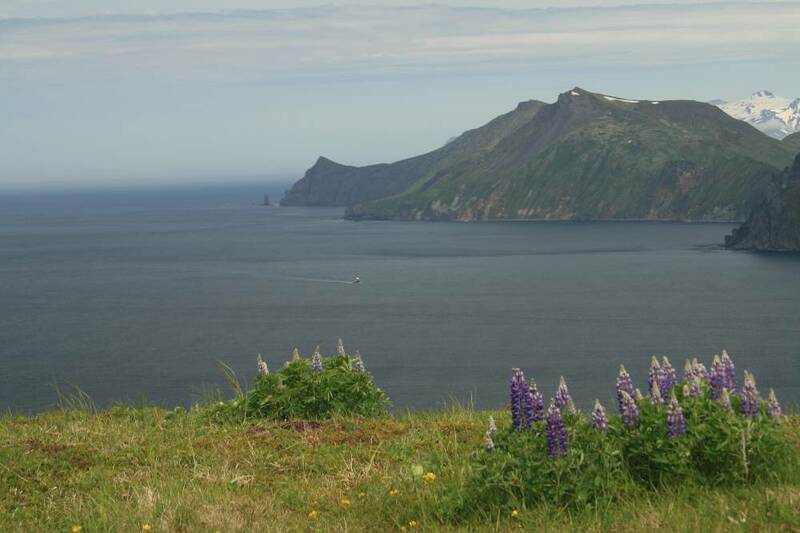 Young Pollock start their lives down near the Aleutians to the southeast, then migrate Northwest towards Russia, where lots of food is waiting for them. Alaskan Pollock avoid the deep! 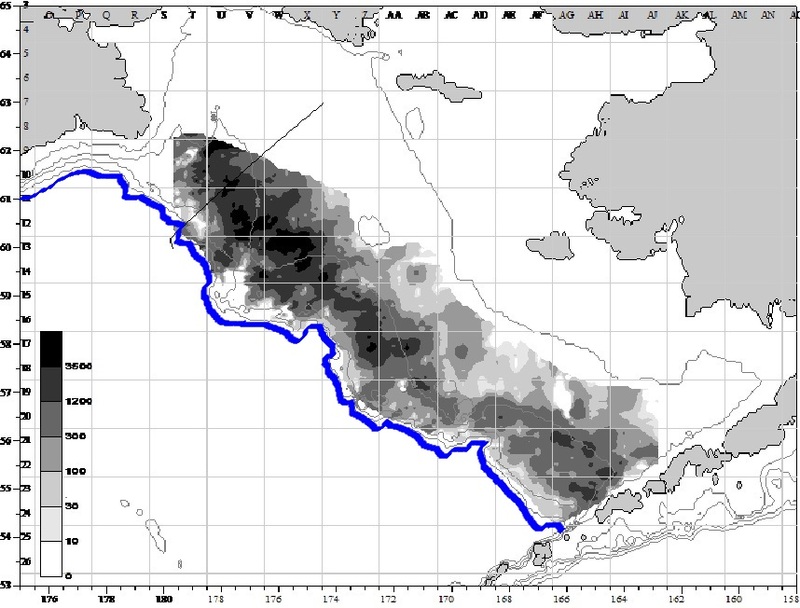 Purple line represents the ocean floor right before it drops off into the Aleutian Basin… a very deep place! The purple line drawn in represents the drop-off you saw above… right before the deep zone. Pollock tend to stay in the shallow areas above it… where the eating is good! Once again, the dance between the abiotic and the biotic create an ecosystem. Over the abyss, Phytoplankton can’t take advantage of nutrients from the deep, and fish can’t take advantage of the phytoplankton. Nonliving aspects have a MASSIVE impact on all the organisms in an ecosystem. 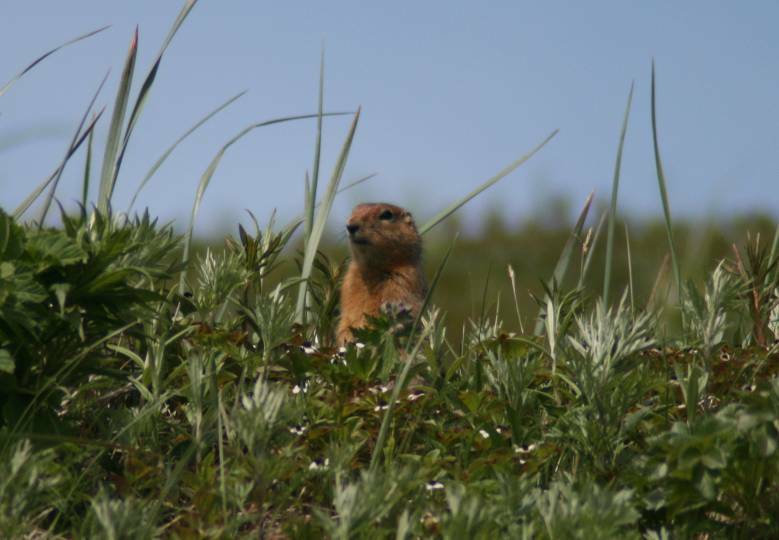 Next time we explore the Biotic side of things… the Sub-arctic food web! Personal Log: The Order of the Monkey’s Fist. Sweet William, a retired police officer turned ship’s engineer, tells the story of the order of the monkey’s fist. The story goes that some island came up with a clever way to catch monkeys. They’d place a piece of fruit in a jar just barely big enough for the fruit to fit through and then leave the jar out for the monkeys. When a monkey saw it, they’d reach their hand in to grab the fruit, but couldn’t pull it out because their hands were too big now that they had the fruit in it. The monkey, so attached to the idea of an “easy” meal wouldn’t let go, making them easy pickings for the islanders. The Monkey’s Fist became a symbol for how clinging to our desires for some things can, in the end, do more harm than good. That sometimes letting go of something we want so badly is, in the end, what can grant us relief. Another story of the origin of the monkey’s fist goes like this: A sea captain saw a sailor on the beach sharing his meal with a monkey. Without skipping a beat, the monkey went into the jungle and brought the sailor some of HIS meal… a piece of fruit. Whatever the true origin of the Order is, the message is the same. Generosity beats selfishness at sea. It’s often better to let go of your own interests, sometimes, and think of someone else’s. Onboard the Oscar Dyson, when we see someone committing an act of kindness, we put their name in a box. Every now and then they pull a name from the box, and that person wins something at the ship store… a hat or a t-shirt or what have you. Of course, that’s not the point. 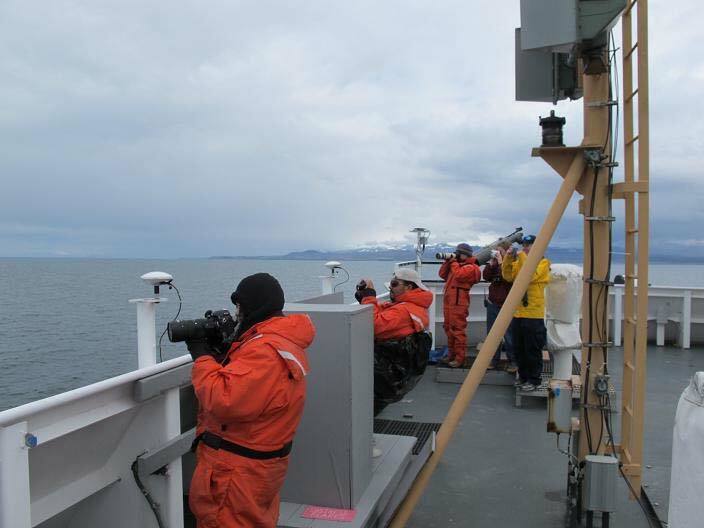 The point is that NOAA sailors… scientists, corps, and crew… have each other’s backs. They look out for each other in a place where all they really have IS each other. 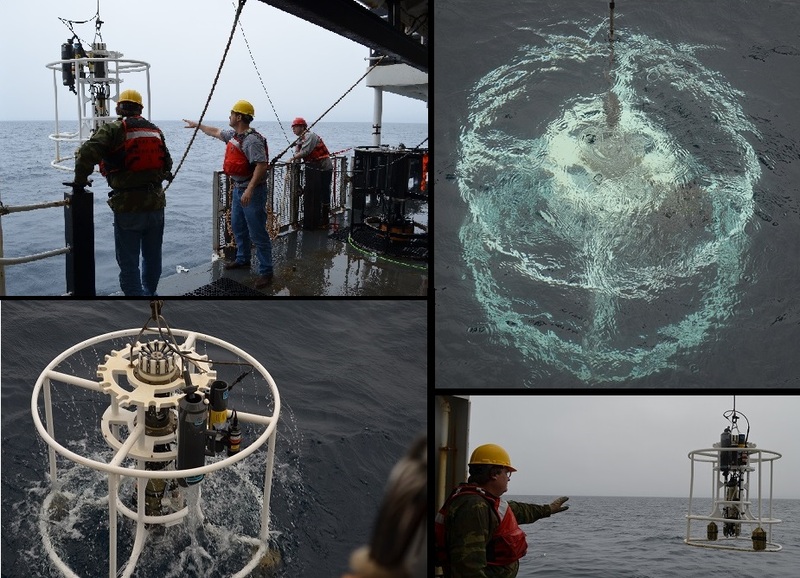 As I described previously, one of the instruments being deployed on this cruise is an Acoustic Doppler Current Profiler (ADCP), which measures speed and direction of ocean currents across an entire water column using the principle of Doppler shift (effect). The Doppler Effect is best illustrated when you stop and listen to the whistle of an oncoming train. When the train is traveling towards you, the whistle’s pitch is higher. When it is moving away from you, the pitch is lower. The change in pitch is proportional to the speed of the train. The diagrams below illustrates the effect. 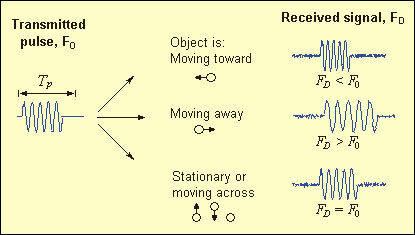 The ADCP exploits the Doppler Effect by emitting a sequence of high frequency pulses of sound (“pings”) that scatter off of moving particles in the water. Depending on whether the particles are moving toward or away from the sound source, the frequency of the return signal bounced back to the ADCP is either higher or lower. Since the particles move at the same speed as the water that carries them, the frequency shift is proportional to the speed of the water, or current. The ADCP has 4 acoustic transducers that emit and receive acoustical pulses from 4 different directions. Current direction is computed by using trigonometric relations to convert the return signal from the 4 transducers to ‘earth’ coordinates (north-south, east-west and up-down. (http://oceanexplorer.noaa.gov/technology/tools/acoust_doppler/acoust_doppler.html). The most common frequencies used on these units are 600 KHz, 300 KHz, and 75 KHz. The lower the frequency the greater the distance that the wave can propagate through the ocean waters. 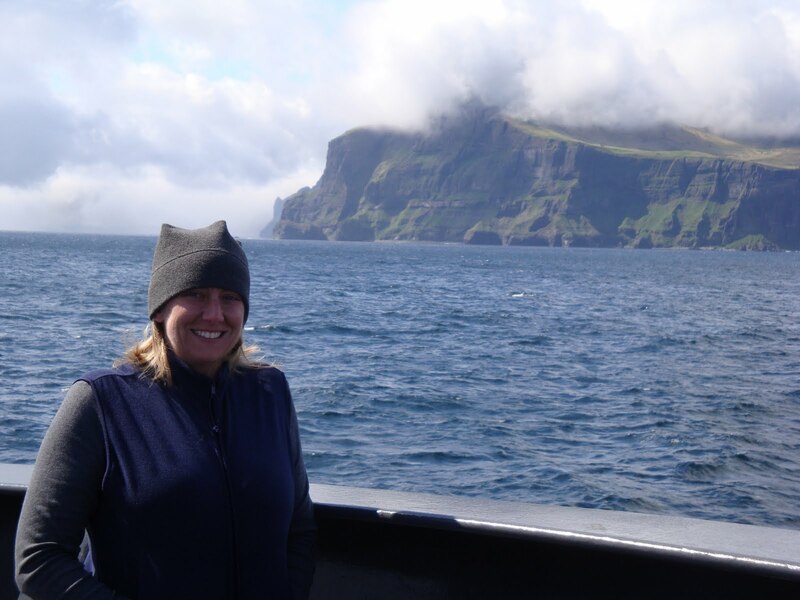 Determining current flow helps scientist to understand how nutrients and other chemical species are transported throughout the ocean. Typical 4 beam ADCP sensor head. The red circles denote the 4 transducer faces. 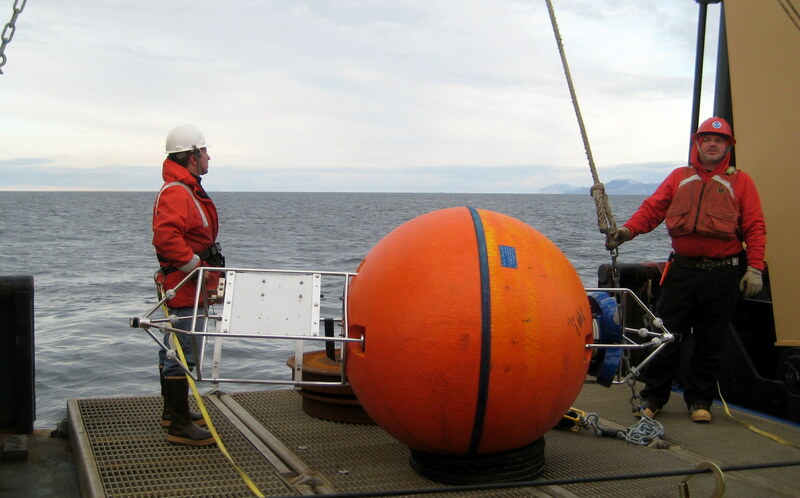 Prior to sailing, ADCP mooring locations are selected by various research scientists from within NOAA. Next, engineers develop a construction plan to secure the unit onto the ocean floor. Once designed, the hardware needed to construct the mooring is sent to the ship that will be sailing in the selected mooring locations. 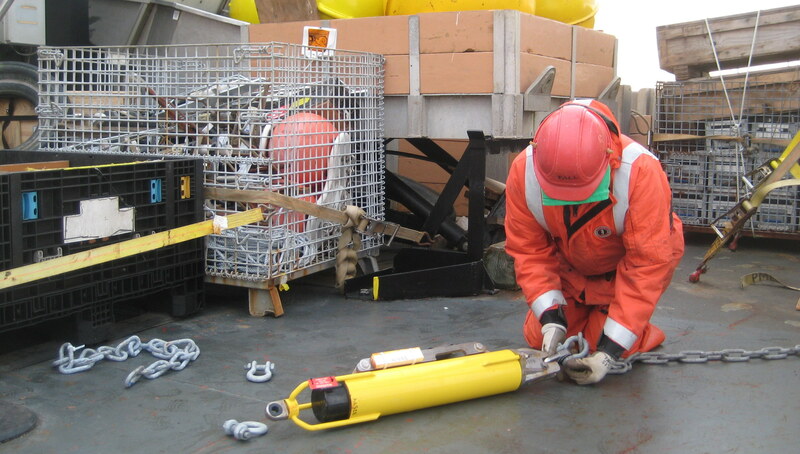 Prior to arriving at the designated location it is the responsibility of the science team to construct the mooring setup following the engineering diagram shipped with each ADCP unit. 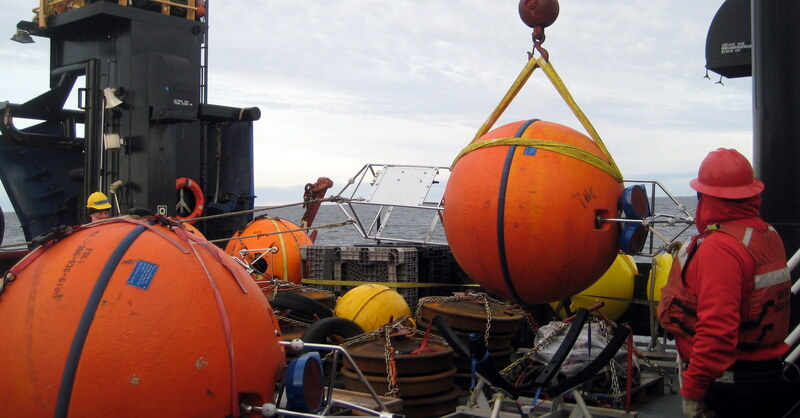 ADCP moorings can be constructed to hold a wide variety of measuring instruments depending upon the ocean parameters under study by the research scientist. The moorings are built on the ship’s deck starting with an anchor. 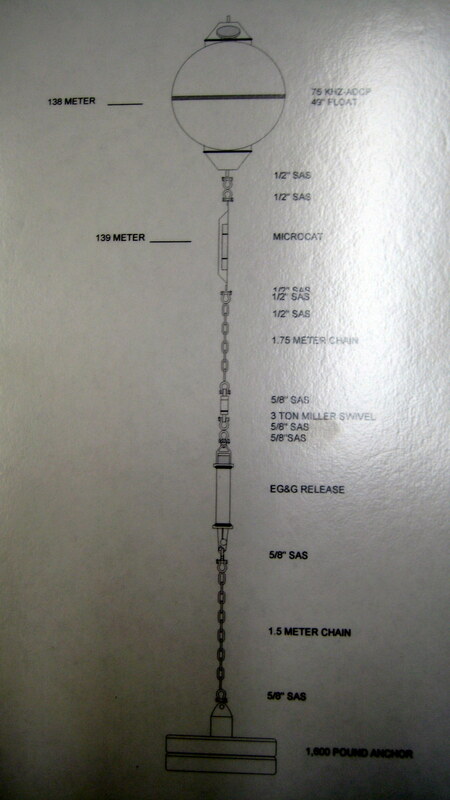 The anchor weight is determined based upon known current strength in the area where the mooring will be located. Anchors are simply scrap iron railroad train car wheels which bury themselves into the sediment and eventually rust away after use. 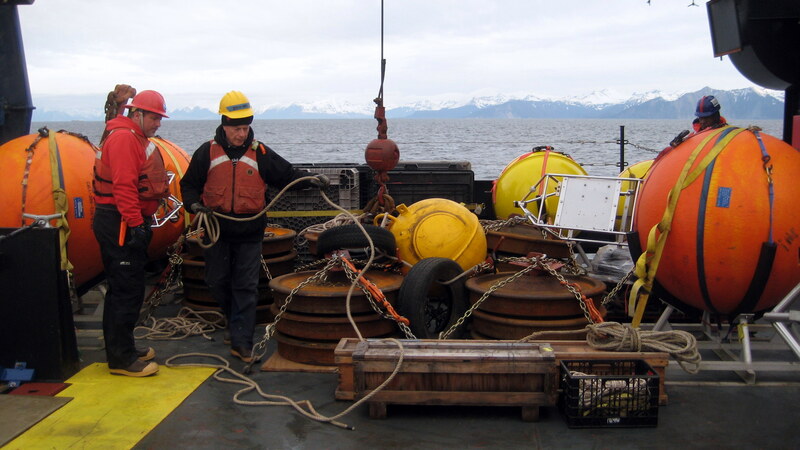 The first mooring unit that we assembled had an anchor composed of two train wheels with a total weight of 1,600lbs. Although this mooring was built from the anchor up this is not always the case. When setting very deep moorings the build is in the reverse order. Next, an acoustic release mechanism is attached to the anchor by way of heavy chains. This mechanism allows for recovery of the ADCP unit as well as the release mechanism itself when it is time to recover the ADCP. The units that we are deploying will remain submerged and collect data for approximately 6 months. Finally, an orange closed-cell foam and stainless steel frame containing the actual instrumentation is connected to the assembly and then craned over the back deck. The stainless steel frame has a block of zinc attached to it which acts as a sacrificial anode. Sacrificial anodes are highly active metals (such as zinc) that are used to prevent a less active metal surface from rusting or corroding away. In fact, our ship has many such anodes located on its hull. 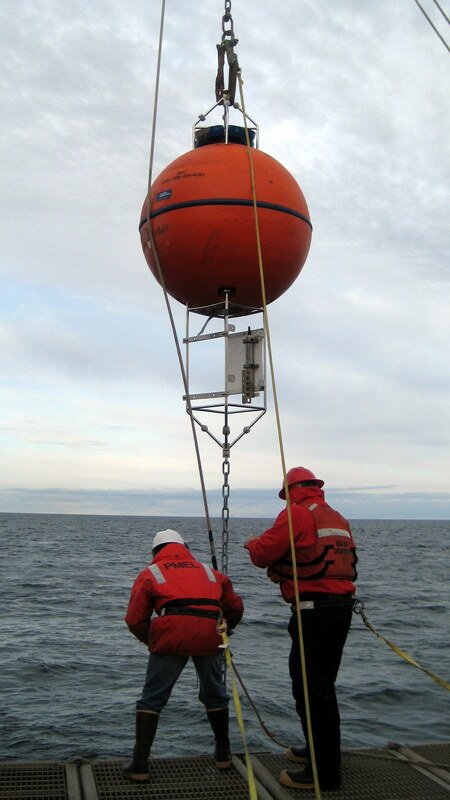 Once the entire unit is in position, a pin connected to a long chord is pulled from a release mechanism and the unit is dropped to the ocean floor. Date, time, and location for each unit are then recorded. To recover the unit, an acoustic signal (9-12 Khz) is sent to the ship from the sunken mooring unit to aid in its location. Once located, a signal is used to activate a remote sensor which powers the release mechanism to open. The float unit then rises to the surface bringing all of its attached instruments along with it. 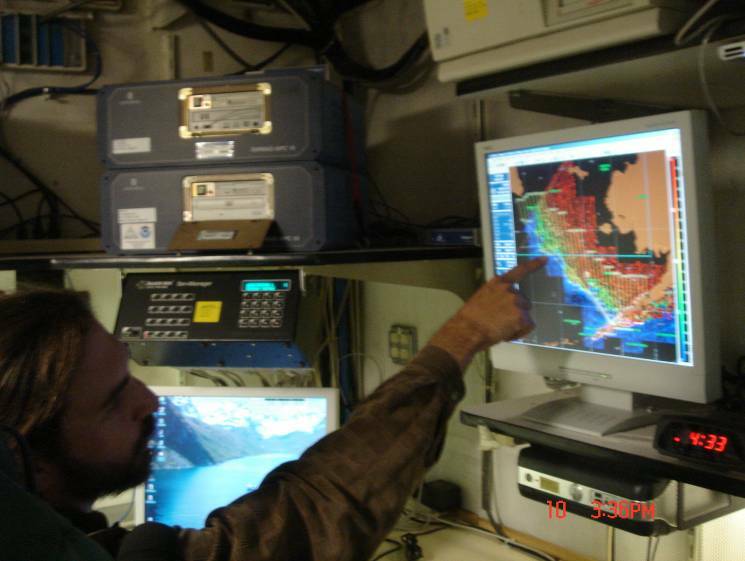 The stored data within the units are then secured and eventually sent along to the research scientist requesting that specific mooring location for ocean current analysis. On my first day of “work” I was able to watch the science teams deploy three different ADCP moorings as well as conduct several CTD runs. I will discuss CTD’s in more detail in future blogs. I was impressed by the camaraderie among all of the science team members regardless of the institution that they represented as well as with members of the deck crew. They all work as a very cohesive and efficient group and certainly understand the importance of teamwork! Adjusting to my new work schedule is a bit of a challenge. After my work day ended today at 1200 hours, I fell asleep around 1500 hours for about 4 hours. After trying to fall back asleep again, but to no avail, I decided to have a “midnight” snack at 2000 hours (8pm). I finally fell asleep for about 2 more hours before showering for my next shift. I think I now have more empathy for students who come to my 8am chemistry class and occasionally “nap”! A wide selection of food is always available in the ship’s galley. I have discovered that I am not the only one taking advantage of this “benefit”! I will definitely need to reestablish an exercise routine when I return home. 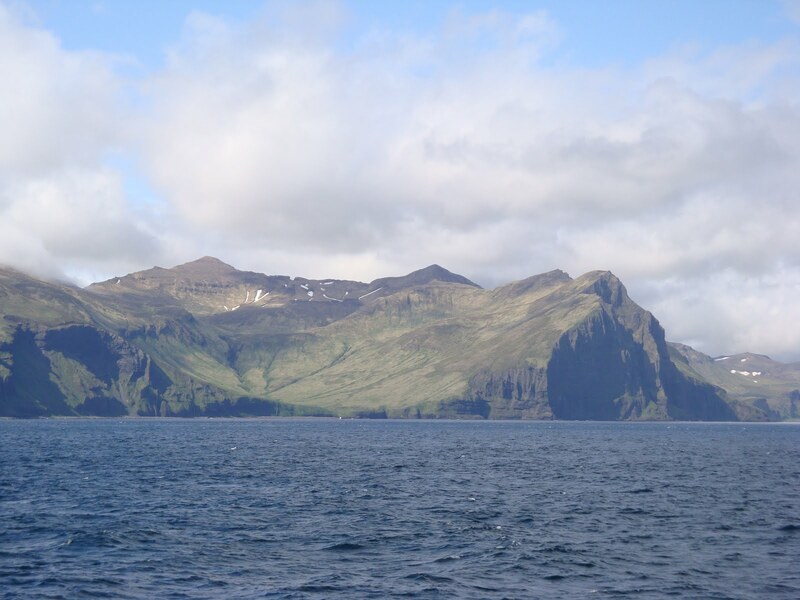 We are currently heading for Unimak Pass which is a wide strait between the Bering Sea and the North Pacific Ocean southwest of Unimak Island in the Aleutian Islands of Alaska. 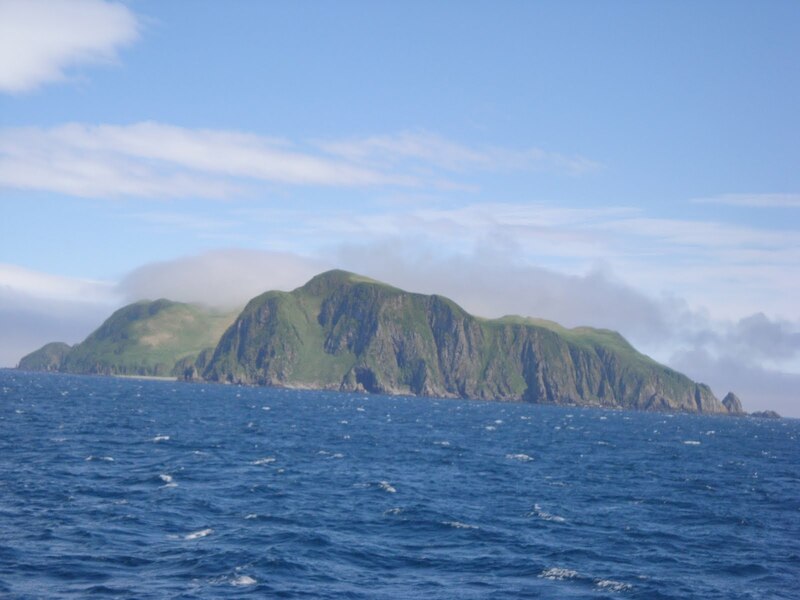 Did you know that since the island chain crosses longitude 180°, the Aleutian Islands contain both the westernmost and easternmost points in the United States. (172° E and 163° W)! 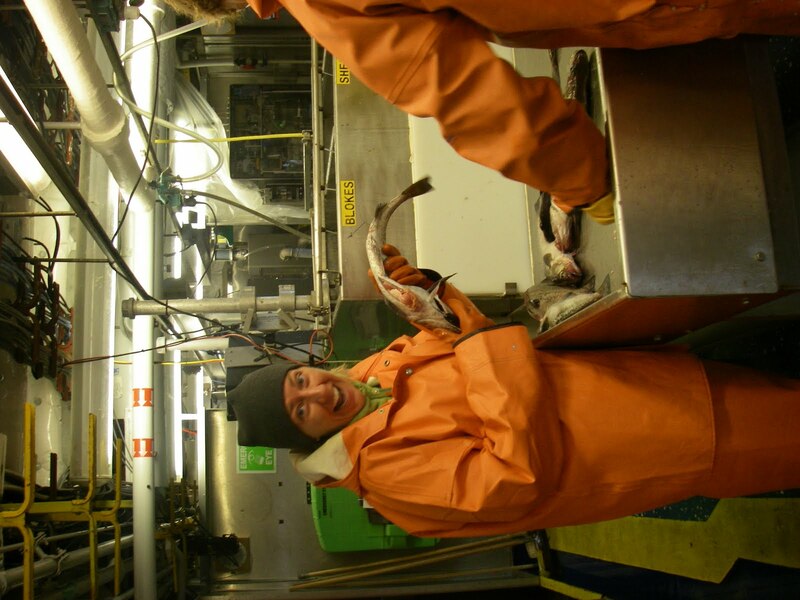 Science & Technology Log: walleye pollock, which is an important fish species here in Alaska. Walleye pollock make up 56.3% of the groundfish catch in Alaska (http://www.afsc.noaa.gov/species/pollock.php), and chances are you’ve eaten it before. It’s a commonly used fish in all of the fast food restaurants, in fish sticks, and it’s also used to make imitation crab meat. Our first catch had a little over 300 walleye pollock, and we processed all of them. Three hundred is an ideal sample size for this species. 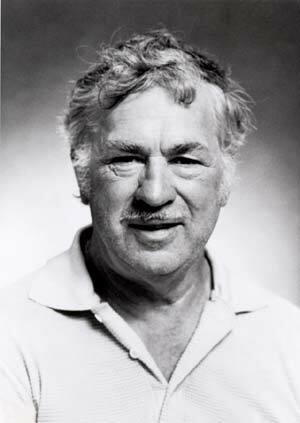 If, for example, we had caught 2,000 pollock, we would only have processed 300 of the fish, and we would have released the rest of them back into the ocean. Check out the photos/captions below to see how we process the catch. After sexing, we then measured the length of each fish. There’s a ruler embedded in the lab table, and we laid each fish down on the ruler. 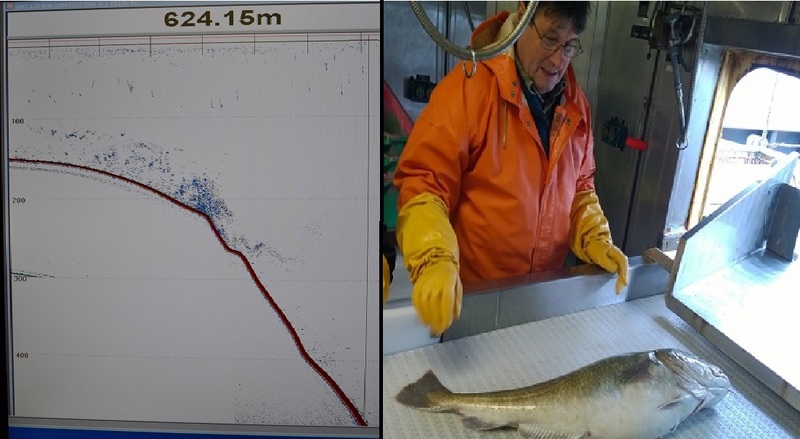 Then we put a hand-held sensor at the caudal (tail) fin of the fish, and the total length was recorded on a computer. At the sexing station, cutting open pollack. We also removed and preserved 20 stomachs from randomly selected fish in order to (later) analyze what they had been eating prior to them being caught. One of the last things we do is collect otoliths from each of those 20 fish. Otoliths are ear bones, and they are used to determine the age of a fish- they have rings, similar to what you see in trees. Basket Star. Marine 1: What phylum are sea stars in? The reason(s) WHY they’re called ARROWTOOTH flounder. * I did spot some kind of pinniped yesterday, but have no idea what exactly it was! 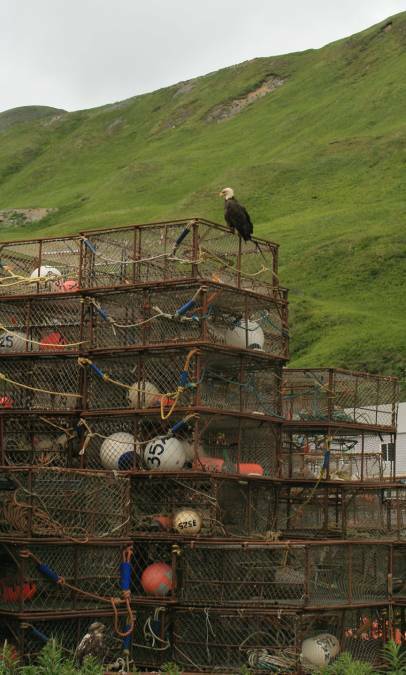 We passed by Dutch Harbor yesterday- it should sound familiar if you watch Deadliest Catch. We didn’t go into the Harbor, so no, I didn’t see any of the crab boats or any of the guys from the show! 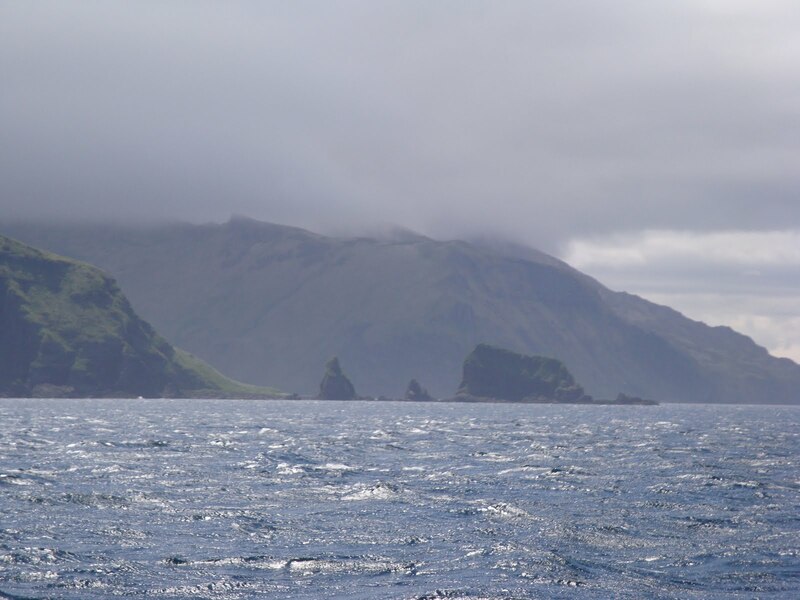 Below are some pics of the Aleutian Islands that I’ve see thus far…many more to come, since we still have another 13 days (give or take) of sailing left! 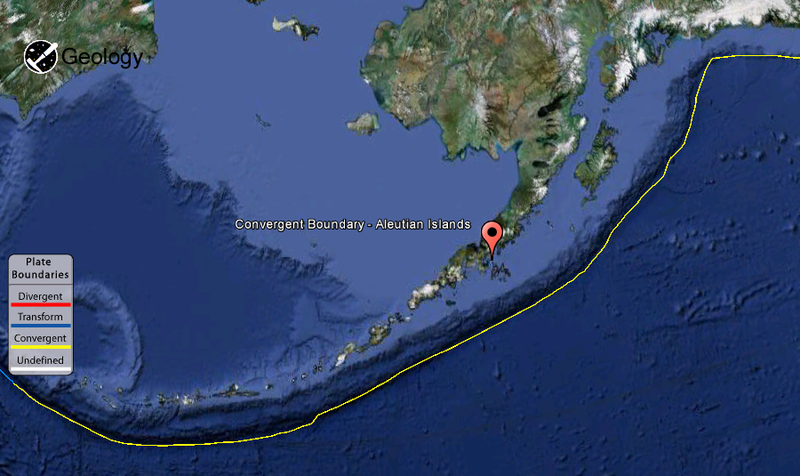 The Aleutian Islands were formed at the boundary where the North American and Pacific Plates are coming together. 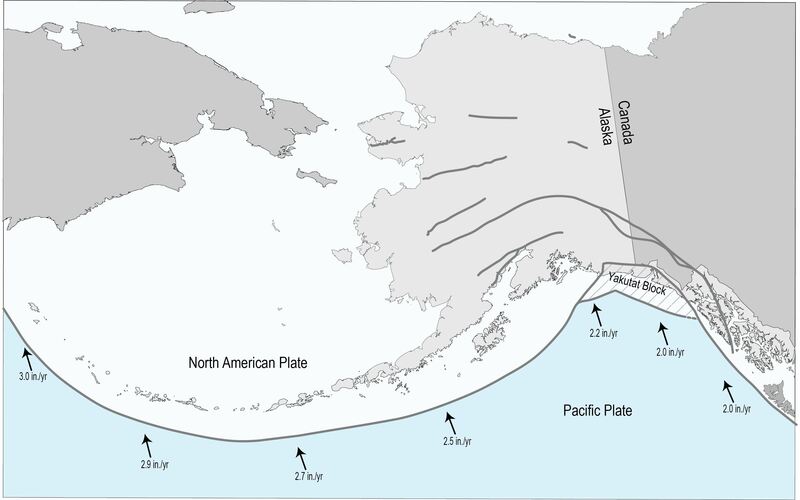 The Pacific Plate is denser than the North American Plate, so it slides underneath the North American Plate. 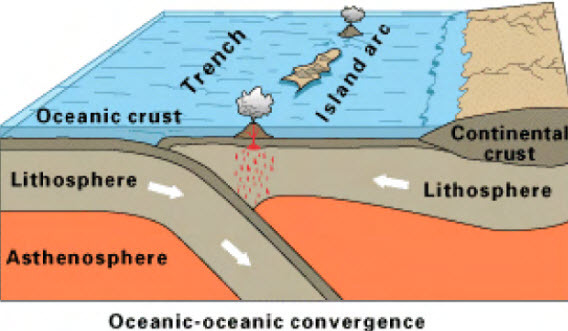 What is this type of plate boundary called (where plates move towards each other), and what is it called when one plate slides underneath another? One thing we’re doing on this trip is trawling for fish. We are conducting both mid-water and bottom trawls. Describe one advantage and one disadvantage to trawling in order to gather scientific data. 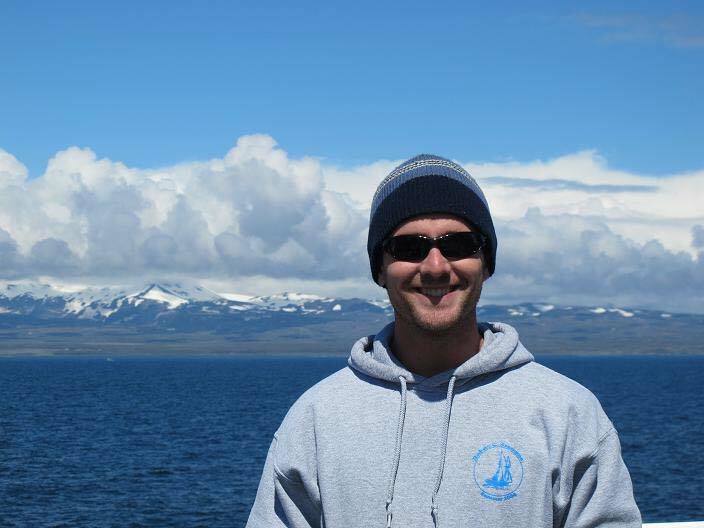 In addition to hosting fish biologists studying walleye pollock, the NOAA ship Oscar Dyson also has groups of researchers studying birds and marine mammals aboard. 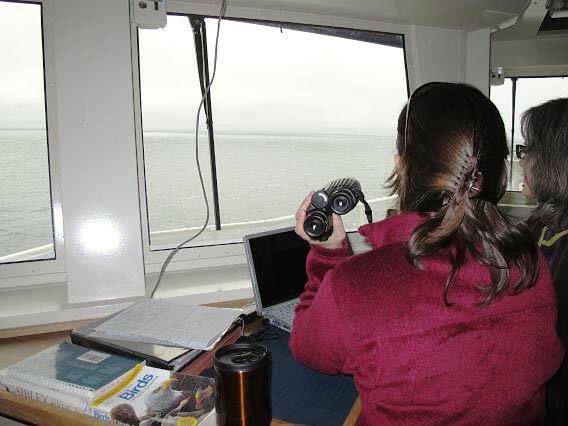 Both the birders and marine mammal observers are conducting supplementary projects taking advantage of the Dyson’s cruise track. As the Dyson sails back and forth across the Bearing Sea along equally spaced parallel transects, these researchers are able to survey a wide area of habitat, investigating not only what animals are present and absent in these waters, but also how many are present (called abundance). These surveys are considered passive since these researchers are not actively directing the ship’s movements but are surveying along the cruise track laid out by the fish biologists. Our migratory bird observers are Liz Labunsky and Paula Olson from the United States Fish and Wildlife Service (USFWS). 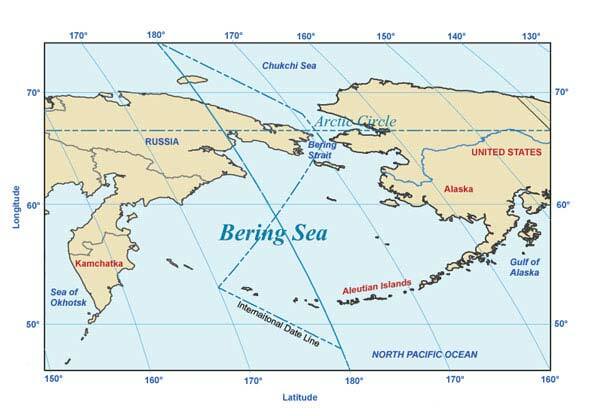 They are members of the North Pacific Pelagic Seabird Observer Program and are providing data for the Bering Sea Integrated Ecosystem Research Project. Pelagic seabirds are birds found away from the shore on the open ocean. Liz is from Anchorage, Alaska and has been involved with this project since 2006. 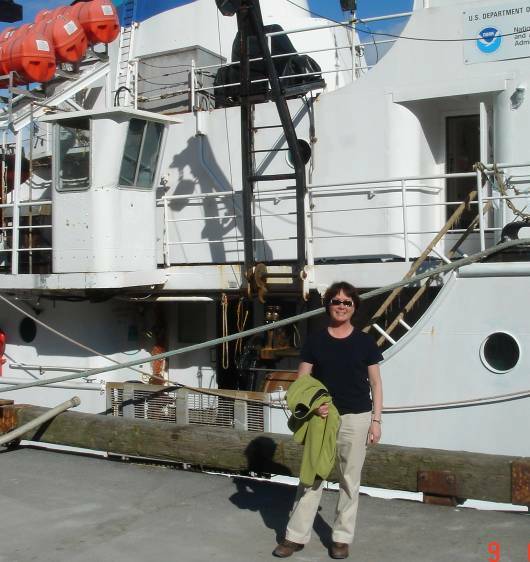 Calling Gloucester, Massachusetts home, Paula is new to these waters but has spent years studying the birds of Prince William Sound as part of the ecosystem monitoring efforts resulting from Exxon Valdez oil spill. Liz and Paula work for two-hour alternating shifts from the bridge. They continuously survey an area of water 300 meters by 300 meters in size. They are looking for birds both on the water’s surface and flying through the air. Liz and Paula must have quick eyes and be very familiar with a wide variety of birds. Identifying birds on the move can be very challenging. Often you only have only a few seconds to train your binoculars on your target before your query becomes a spot on the horizon. In addition, the same species of bird can vary greatly in appearance. Liz and Patti may only see a handful of birds over an entire morning but can also witness hundreds at any given moment! One constant challenge for observers aboard moving vessels is counting the same bird multiple times. 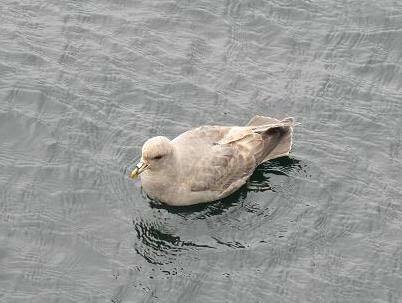 For example, you will often spot northern fulmars flying laps around the Dyson when underway. To avoid introducing this bias (or error) in their survey, flying birds are only counted at certain time intervals called scan intervals. The frequency of these scan intervals are determined by the speed at which the Dyson is traveling. For example, when the Dyson is traveling 12 knots, birds flying are counted every 49 seconds. If the Dyson is traveling slower, the time is reduced. 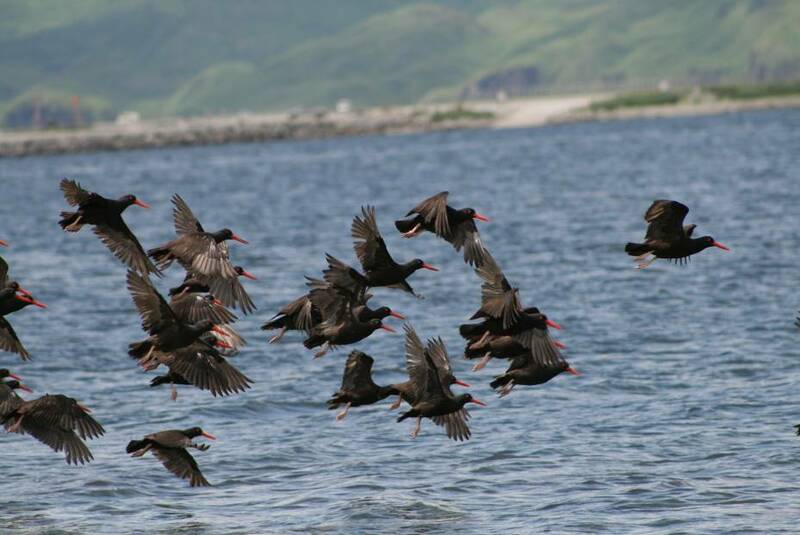 While very familiar with the coastal birds of Georgia, I have been introduced to several new species of birds found in the Bering Sea. I have become a big fan of the tufted puffin. Easily identified by their reddish orange bills, tufted puffins resemble little black footballs when flying. These birds dive in the frigid waters to catch fish, their favorite prey. The black-footed albatross is another bird new to me identified by the white markings around the base of the beak and below the eye along with its large black feet. One of my favorite observations with Liz and Patti was identifying a group of northern fulmars so tightly packed on a piece of driftwood that it showed up on the ship’s radar! Just before my shift ended around 1545 hours, a call came over the radio from Yin, one of the Dyson’s three marine mammal observers. 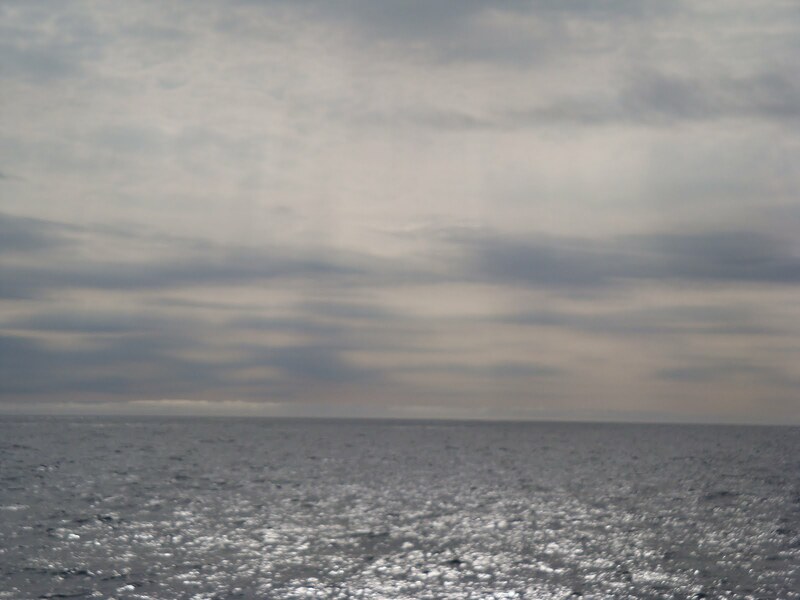 She reported that a large number of humpback whale blows had been spotted on the horizon. A blow refers to the spray of water observed when a whale surfaces for a breath of air. 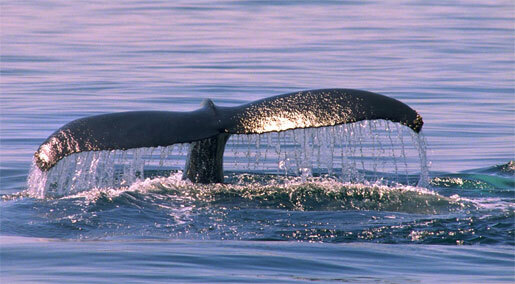 Like all mammals, whales have lungs and must surface to breath. The humpback whale is a baleen whale that feeds on krill (small marine invertebrates that are similar to shrimp) and small fish in the summer. Krill is a major link in the marine food web, providing food for birds, marine mammals, and fish such as pollock. Baleen whales have plates made of baleen instead of teeth that are used to separate food from the water. Baleen resembles a comb with thick stringy teeth. Think of the movie Finding Neo when Marlin and Dory are caught in the whale’s mouth. Not sure how many whales constitute a large group, I eagerly headed to the bridge to see if I could catch a glimpse of this well-known marine mammal. I quickly climbed four companionways (a stair or ladder on a ship) up to the flying bridge from the main deck where the acoustics lab is located. Upon reaching the highest point on the vessel, I was told that I was in for a treat as we were approaching a massive aggregation (a group consisting of many distinct individuals or groups) of humpback whales. Whales often travel in small social groups called pods, but this gathering was much larger than usual. This gathering was more than a single pod of whales as there were so many blows you didn’t know which way to look! The Dyson’s CO (Commanding Officer), Commander Michael Hoshlyk, carefully maneuvered through the whales affording the growing gathering of onlookers a great view. Observations from the Dyson’s fish biologists and birders supported the hypothesis from marine mammal observers that these whales were almost certainly gathered together to feed. 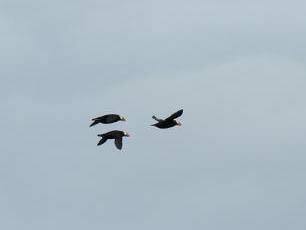 Evidence to support this conclusion included acoustic data and the presence of large numbers of seabirds. The Dyson’s transducers showed large acoustic returns that were most likely from plankton (organisms that drift in the water) such as krill. 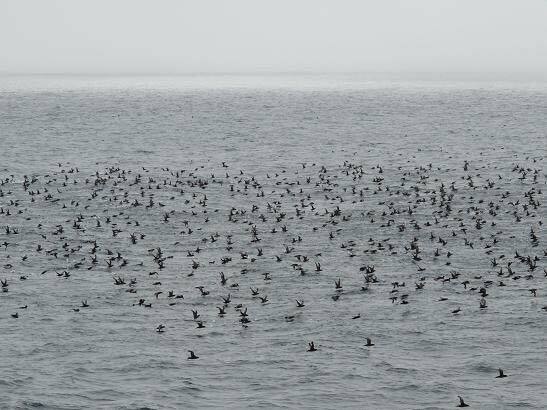 There were also countless numbers of shearwaters (medium-sized long winged sea birds) gathered where the whales were swimming. 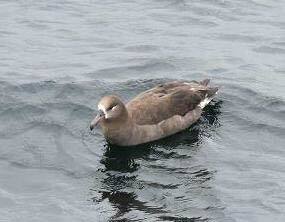 Estimating the number of whales and shearwaters proved difficult because of their large numbers. The first group of whales numbered at least 50, and we later encountered a second group of humpbacks that numbered around 30. The shearwaters numbered in the thousands! 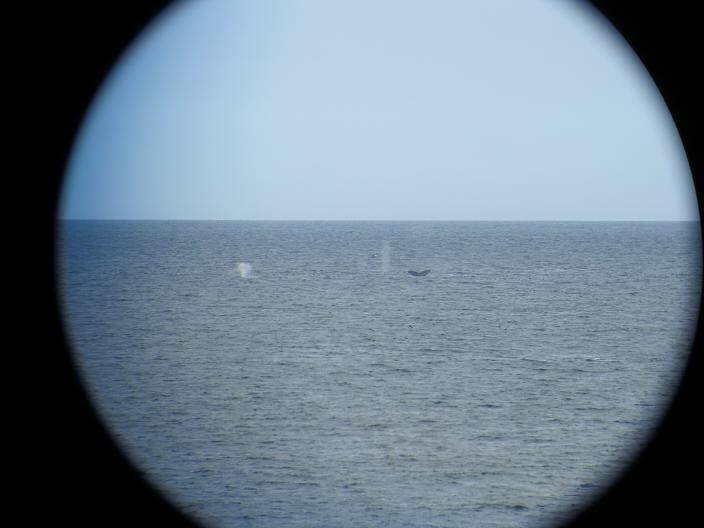 I was able to capture some great pictures of the flukes (the horizontal tail of the whale used for propulsion) and blows of the humpbacks by holding my camera up to the powerful BIG EYES binoculars. Looking through the BIG EYES gave me the sensation being so close that I almost expected to feel the spray of water every time the whales surfaced for a breath. I counted myself fortunate to see this inspiring and unforgettable sight. Along with the beautiful weather, the opportunity to see these amazing creatures of the deep made for a very enjoyable cruise to the beginning of the pollock survey. Viewing humpback whales equals a Kodak moment! You will often hear the word ‘bearing’ used on the bridge of the Dyson. A bearing is a term for direction that relates the position of one object to another. For example, the Dyson’s lookout might call out, “Fishing vessel, bearing three one five degrees (315°)”. This means the fishing vessel is in front of and to the left of the ship when facing toward the bow. A bearing does not relate distance, only direction. The area around the Dyson is divided into 360 equal parts called degrees. One degree is equal to 1/360th of a circle. When calling out a bearing, degrees allow for precise communication of an object’s relative position to that of the Dyson. The Dyson always has a member of the deck crew stationed on the bridge serving as lookout when underway. 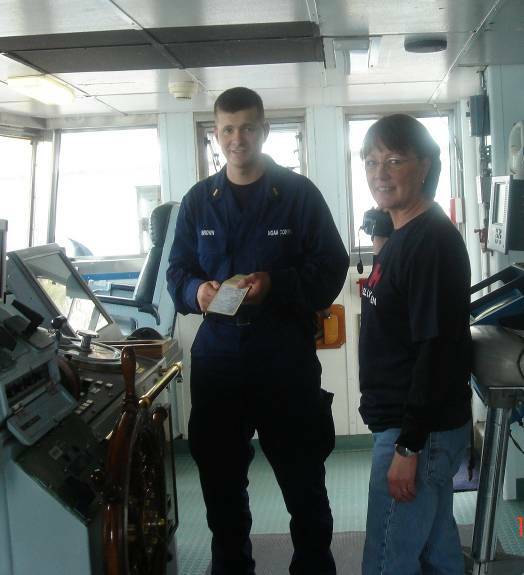 The lookout’s responsibility is to monitor the water around the Dyson for boat traffic, hazards in the water, or any other object important to the safe navigation of the ship. Science and Technology Log: Who was Oscar Dyson? The 206-foot OSCAR DYSON is one of the newest ships in NOAA’s fleet, and was commissioned in 2005. 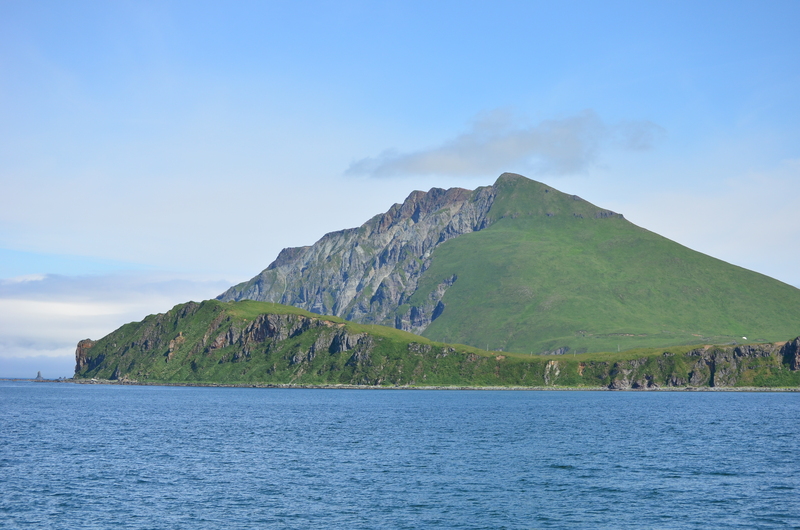 The OSCAR DYSON is home ported in Kodiak, Alaska, and sails primarily in the Gulf of Alaska, the Aleutian Islands, and the Bering Sea, researching fish stocks, marine mammals, and seabirds, observing weather, sea and environmental conditions, and conducting habitat assessments. 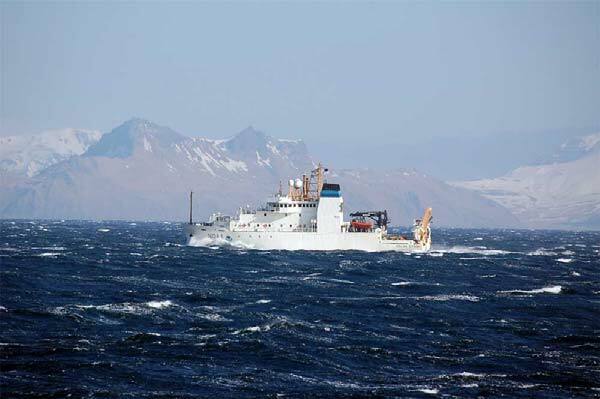 The ship is a stern trawler, and is outfitted with two trawl nets, among others, to support the annual fish surveys and biological assessments that are conducted in support of commercial fisheries, primarily pollock. The OSCAR DYSON is outfitted with a Scientific Sonar System, which can accurately measure the biomass of fish in the survey area. 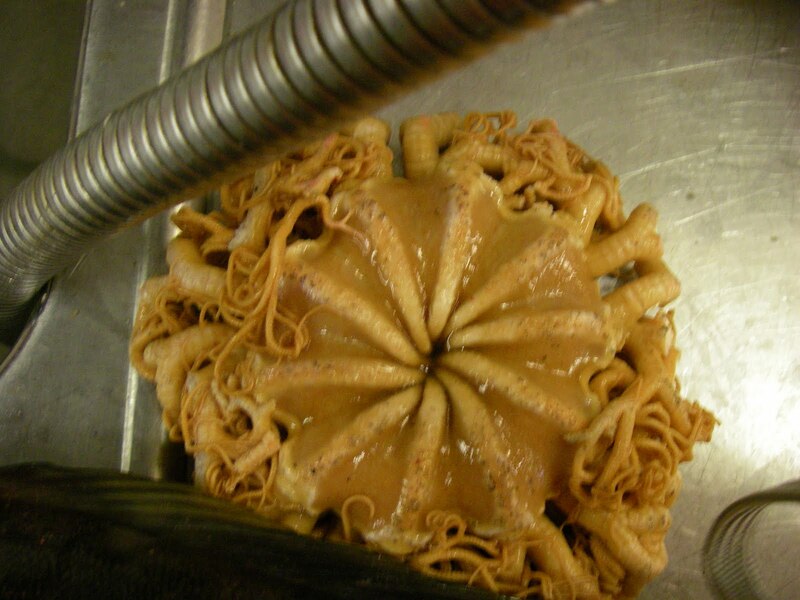 Trawling is used to collect specific biological data, such as length, weight, and gender of the sample. 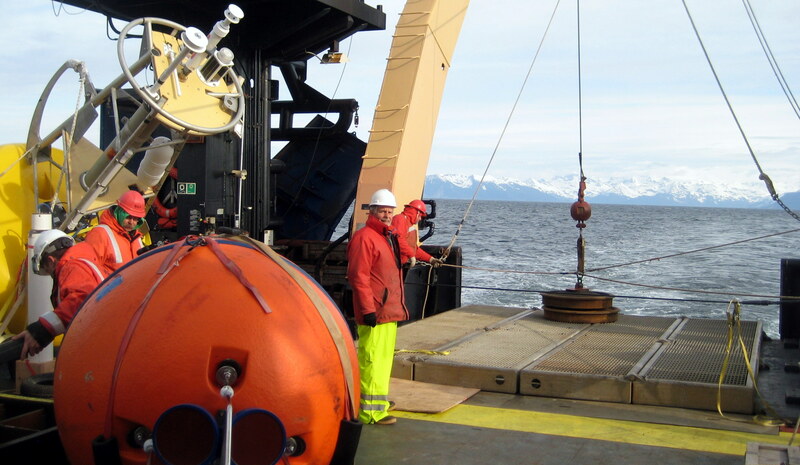 Weather, sea and environmental data are also collected continuously using hundreds of sensors on board, such as the Acoustic Doppler Current Profiler (ADCP), which measures ocean currents. 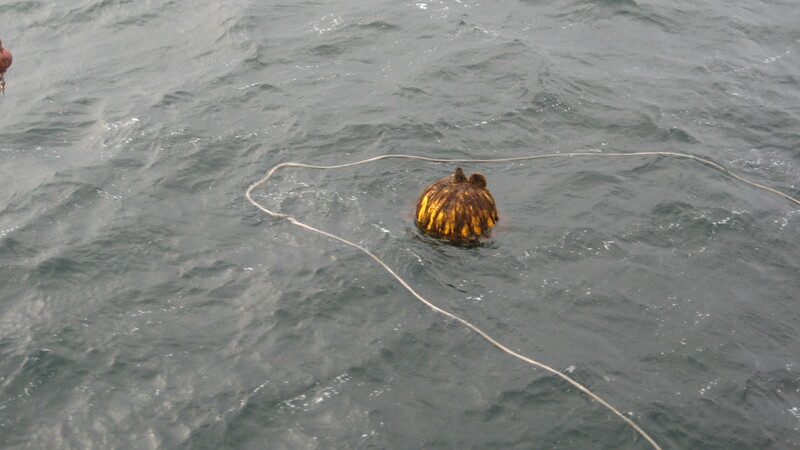 The OSCAR DYSON can also assist in maintaining and deploying stationary buoys to collect similar information for a specific area at depth over time. In support of the science mission of the OSCAR DYSON, the ship has been built to minimize sound. By decreasing the hull noise, scientists are better able to observe fish without disturbing their natural behavior. Another special feature of the OSCAR DYSON is a retractable centerboard that carries many of the sensors used in scientific studies. By lowering the sensors over 10 feet below the hull, the acoustic data collected by the scientists is less affected by the ship’s noise. When retracted, the scientists and crew aboard the OSCAR DYSON are able to access the sensors for maintenance and replacement as needed. My leg of the summer Pollock survey is drawing to a close, and we have ended with some different kinds of trawls. We’ve collected jellyfish and plankton, and we’re still hoping to trawl using a special net that opens and closes, enabling the scientists to target multiple sets of fish at multiple depths in one cast. We’re ending with much improved weather, which has been a welcome change for everyone. 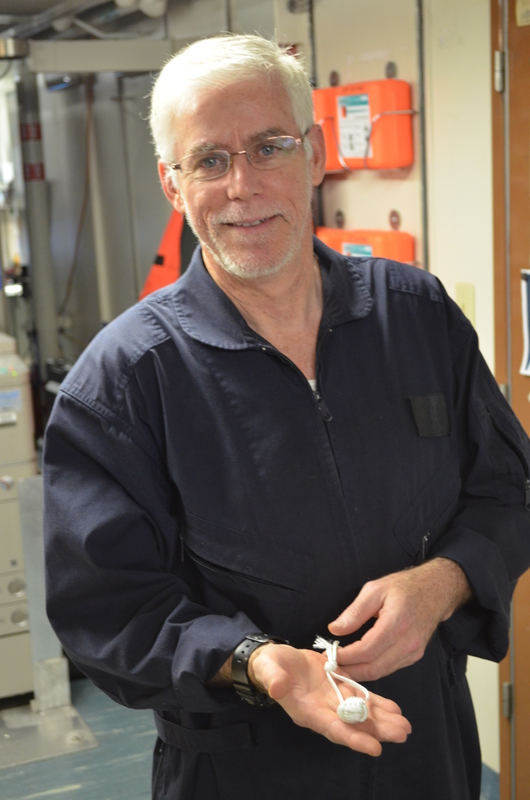 The crew of the OSCAR DYSON has made this experience particularly memorable, with scientists explaining their work in detail and crewmembers sharing their knowledge willingly. I’ve toured the engine room, spent time on the bridge, eaten once-in-a-lifetime meals, talked commercial fishing with the deckhands and even learned to tie some knots and splice lines with their help. It has been an amazing learning experience!